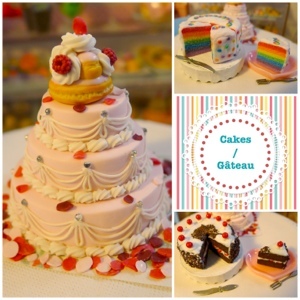 Cake is such a wonderful dessert that it has it's own menu category! You will find more details for these new cakes in the new menu item. I recently managed to get my hands on a new material for model making - and now I can make delectable looking jellies! For more details on each item please see the new menu item 'Jelly / Gelatine'. I had a little accident whilst shooting these photos. The weather has been so bad and I feel like I haven't seen the sun for months now. It's spring today yet snow is still falling. The sky is grey all day and I had to resort to using 2 light sources in order to take photographs (yes, I am blaming it on the bleak weather). I had one lamp balancing on my ottoman and with a huge thud it fell onto my diorama!! The 'Ultimate Gelatine' got hit by the lamp and the plate broke and a few strawberry pieces came loose. Miraculously the 'Ultimate Gelatine' is fine and needs some TLC (just need to put the strawberry slices back) and a new platter. I always handle my miniatures with caution but it seems that these gelatine models are tougher than their real edible cousins. After shaking my fist at the lamp, I did have to spend another hour to re-arrange everything back to it's original state. I have serious OCD since if I don't put them back together again I can't stop thinking about it. It would make it hard for me to meditate in yoga class tonight! I am so pleased to bring you not just one, but several new items across the menu board! I have also FINALLY added my Christmas fayre items as well (Hello! It's March?!). Please click the link to the corresponding menu category for more information on the new items. 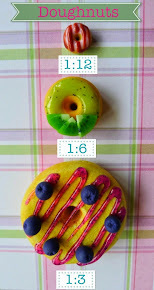 The Littlest Sweet Shop has a new brunch menu so please do take a look at our new food! I call them brunch menu items as they are great for breakfast AND lunch (and anytime really). 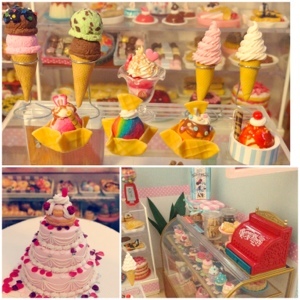 Currently we serve various crêpes, pancakes, waffles and churros! I will keep adding new goodies into the menu so watch this space. 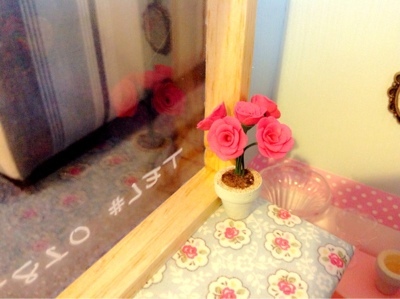 New additions to my diorama - a cute gumball machine, flower pots AND shabby chic upholstery for the bar chairs. 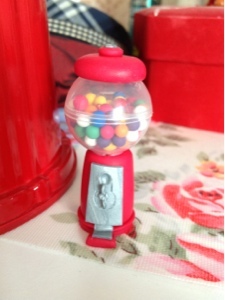 I had always wanted to model a miniature gumball machine since last Christmas. 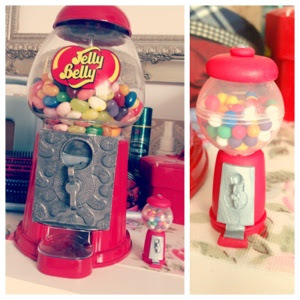 The inspiration struck when I received a Jelly Belly dispenser machine as a gift from my husband. The colour of the bar chairs had to be altered since the original bright Barbie pink did not suit the shabby chic theme of my diorama. 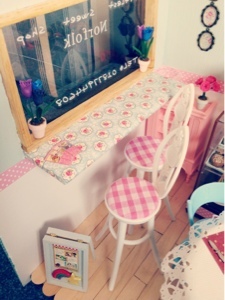 I had some leftover pink gingham material and decided to use it to reupholster the chairs. The process wasn't hard and the chairs went through a smooth make over! 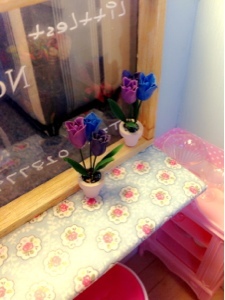 The flower pots are all made by me. The pots are painted using Laura Ashley paints and the flower and leaves are handmade using polymer clay. I don't use molds to make flowers as I believe that each flower should be unique (more realistic?). The diorama will always be a work in progress so I hope you enjoy these incoming updates!